Kittim Sherrod died eight years ago, during a training run near Edison High School, where he was a star on the school football team. No one saw it coming. Sherrod fell victim to a heart condition that had generated no symptoms, and could not be identified without specific cardiac screening. But the life that ended that day in 2011 also began a crusade to raise awareness of undiagnosed heart conditions that can lead to sudden cardiac death among young athletes. Sherrod’s grandmother, Razeenah Walker, has been front and center in that crusade, along with Assemblyman Patrick Diegnan, D-South Plainfield, who has aggressively championed several related measures that have become law in New Jersey. U.S. Rep. Frank Pallone has taken that cause to Washington, re-introducing legislation that would require on a national scale development of a public education campaign on sudden cardiac arrest and guidelines for emergency response plans and defibrillator distribution for schools and other youth facilities. The bill includes a $1 million annual allocation over several years. 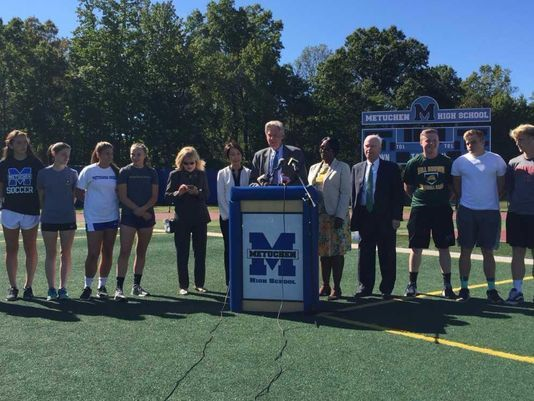 Pallone’s first attempt at such legislation in 2015 didn’t succeed, but he’s trying again and announced his intentions during a press conference at the Metuchen High School football field Monday. Right there with him were Walker and Diegnan, as they continue their own tireless efforts to spread the word about the dangers of sudden cardiac arrest among young athletes and ways to combat it, including more cardiac screening and enhanced capabilities in responding to cardiac arrest. This is a highly worthy cause that can keep people alive, young people. In crediting Walker’s work Diegnan said that 10 lives have been saved due to legislation prompted by Sherrod’s death. The number is likely higher, however; we’ll never know for sure just how many potential deaths might have been averted by greater awareness of the threat. But regardless of the figure, it will continue to grow. New Jersey lawmakers recognized the need for action and took it. Federal legislators need to do the same, quickly. Sherrod’s story is, sadly, far from unique. On average a student athlete dies from sudden cardiac arrest in this country every 3-4 days. The cause is often linked to an undiagnosed heart condition. That was the case with Sherrod, who was found to have suffered from hypertrophic cardiomyopathy — an enlarged heart. Brandon James, a South Brunswick senior, died of the same condition in 2009. Another Middlesex County teen, Nicole Trott of Old Bridge, died in 2011. Those deaths in Middlesex County helped inspire Diegnan to tackle the issue head on in Trenton. Since then several bills have been approved, including measures requiring schools to have automatic defibrillators on site and to include cardiac health questions as part of physical exams. Pallone said that more than 1.5 million young people nationwide have underlying heart conditions that put them at risk for sudden cardiac arrest, conditions that are often undiagnosed. The lives of some of those youths will be saved under Pallone’s bill. That’s more than enough reason to make it happen.